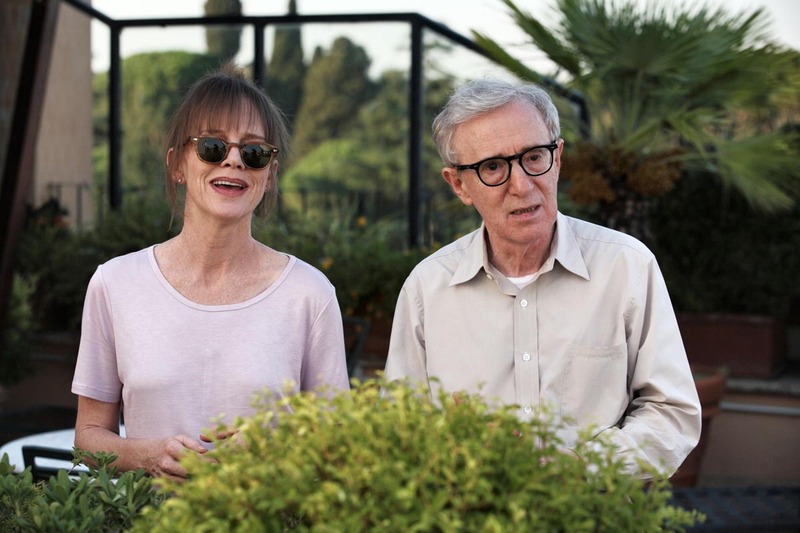 An episodic comedy romance with some fantasy elements, Woody Allen's To Rome With Love offers mild amusement but minimal substance through four unrelated vignettes. American tourist Hayley (Alison Pill) meets and falls in love with Italian lawyer Michelangelo. When Hayley's parents Jerry and Phyllis (Allen and Judy Davis) arrive in Rome for a visit, Jerry, a recently retired opera producer, discovers that Michelangelo's father Giancarlo, a funeral home director, has a magnificent singing voice, but only when he is in the shower. Young student architect Jack (Jesse Eisenberg) lives with his girlfriend Sally (Greta Gerwig). When Sally's alluring friend Monica (Ellen Page) comes for a visit, Jack can't help but fall in love with Monica's seemingly sophisticated charms. John Foy (Alec Baldwin), a successful architect revisiting Rome where he once lived, provides spectral advise to Jack. John and Jack may be the same person, 30 years apart. Antonio and Milly are newlyweds from a rural town who have just relocated to Rome to start a new life and seek better jobs. Inadvertently separated, Antonio finds himself in the compromising company of vivacious prostitute Anna (Penelope Cruz); he has to pretend that Anna is Milly in front of his stuffy relatives. Meanwhile Milly stumbles onto a film set and allows herself to be seduced by famous Italian movie star actor Luca Salta. Leopoldo (Robert Benigni) is an average office clerk with a mundane life. One day he wakes up and inexplicably finds himself an unlikely celebrity, with media and paparazzi hordes chasing after him with microphones and cameras and documenting his every move. A flighty exercise in saluting the ethereal beauty of a city, To Rome With Love is almost astonishing in its lack of depth. While all four stories offer a benign level of enjoyment, the film is the equivalent of flipping through a glossy travel magazine; the articles are at best quick glance-through fluff, the pictures professional but also exceptionally familiar. The entire exercise is wholly forgettable moments after it ends. While none of the stories carry any impact, a couple offer some marginal entertainment. Allen sporadically infuses a common theme of unexpected but non-threatening interventions altering the planned course of life, with the diversions from a charted course coming with both a smile and no explanation needed. The imaginative elements of the film work well, John Foy as a ghostly presence drifting in and out of Jack's life and Leopoldo's sudden detour into an alternate celebrity reality carrying some intrigue. Antonio and Milly experiencing a chaotic start to their life in Rome appears to be a parable for the temptations of the big city, and is less successful. Least interesting of all is Allen inserting his typical neurotic New Yorker persona into the Roman context. The tiresome opera-singer-in-the-shower story starts out as not funny and is then stretched well past its breaking point. To Rome With Love is Allen at his flimsiest, offering some old-world eye candy with a side of empty calories.